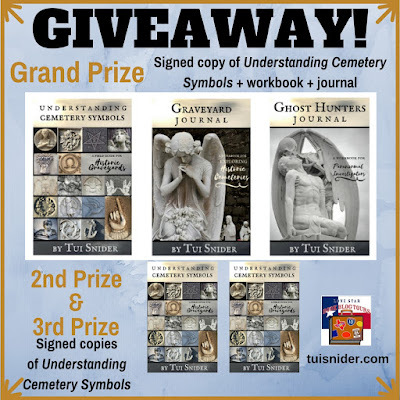 Understanding Cemetery Symbols by Tui Snider helps history buffs, genealogists, ghost hunters, and other curiosity seekers decode the forgotten meanings of the symbols our ancestors placed on their headstones. By understanding the meaning behind the architecture, acronyms, & symbols found in America’s burial grounds, readers will gain a deeper appreciation for these "messages from the dead." "When I ordered this book I thought it would be good for information concerning cemetery symbolism. I was wrong. It is GREAT!!!! This has already become my go to guide for all types of cemetery information. By far the best book I have come across!" "Wow! What a great book! I got bit by the bug doing genealogy research. I always wondered what the symbols meant and could not find a reliable resource for the info. With Ms. Snider's book along with the symbiology and great pictures, also a creative process of Tui's, are plenty of interesting tidbits! Useful and entertaining! The book is small enough to keep in the glove box or your handbag or backpack!!" "I always enjoyed walking through a cemetery and looking at the stones. Now it will give it a much deeper meaning. I really enjoyed reading this book!" - Amazon verified purchase, Deborah D.
"Perfect book to get an idea for symbols and meaning. Only glanced through it and already picked up a few facts! Welcome addition to our growing library..."
What inspired you to write Understanding Cemetery Symbols? Writing research often leads me to historic cemeteries. There’s no better way to resolve how someone’s name is spelled, for instance, than to see it carved in stone. 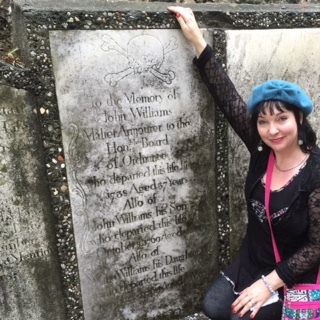 Plus, I just love old graveyards! But I kept seeing acronyms and symbols on the older stones that didn’t make sense to me. I’d come home and research them, but it wasn’t always easy to find the answers. I really wanted a small field guide on the topic that would fit in my glovebox. When I couldn’t quite find what I wanted, I wrote one of my own! 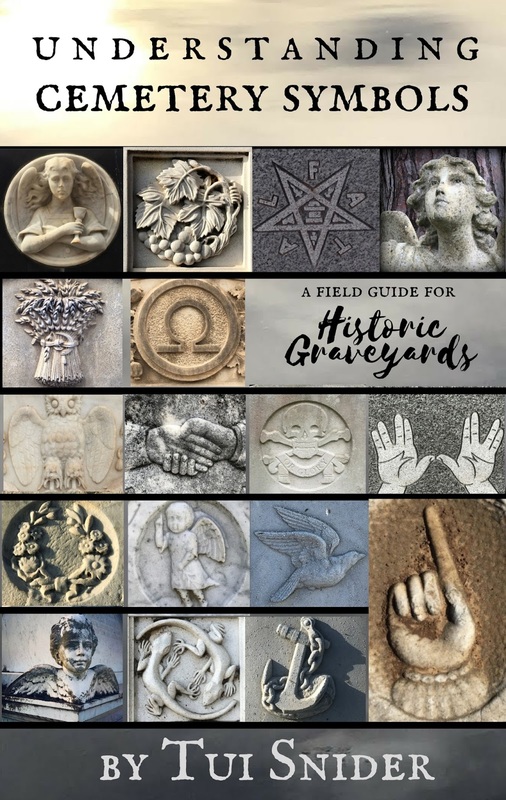 Like any reference book, I’m sure every person will have their own way of using Understanding Cemetery Symbols, but I’d really love it if my book inspired people to visit graveyards in their area for the fun of it. How did our ancestors use symbols differently than we do today? People often claim that the reason our ancestors used symbols on their headstones is because they were illiterate. Only recently did I take a close look at the literacy rates in the USA. This is a big topic in itself but - long story short - we have been and continue to be a highly literate nation. That said, we have forgotten the meaning behind many older symbols. And while we all use symbols every day, us modern folks tend to use them in a much more literal manner than our ancestors. On a modern headstone, a horse’s bridle most likely means the deceased enjoyed riding horses. On a historic headstone, however, a bridle and bit symbolize control over one’s less than saintly urges. If you look into this person’s life in more detail, you might learn that they were part of the Temperance Movement during the Prohibition Era, that they belonged to a strict religious sect, or some other thing that has nothing to do with horses. One of my biggest realizations while writing Understanding Cemetery Symbols is that our ancestors used symbols in a much more poetic way. I think it’s an ability that we’ve lost to a certain degree in modern times. Tell us about the companion workbooks you created for your book and what inspired you to create them. 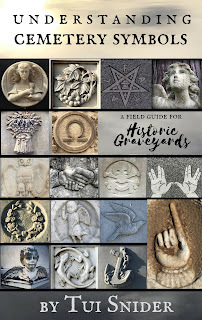 I created two companion workbooks for Understanding Cemetery Symbols: Graveyard Journal, and Ghost Hunters Journal. Graveyard Journal is a workbook for keeping track of all the cemeteries you visit. It has room to record the details for up to 50 different burial grounds. Ghost Hunters Journal, on the other hand, is a place for paranormal investigators to keep track of the various experiences they have, whether they are in a haunted cemetery or elsewhere. Why should people use these workbooks? It’s a good idea to write down the details of your cemetery visits. If you don’t, details get fuzzy over time. You may forget which cemetery has your favorite angel statue, for instance, where the key to the gate is kept, or which farm to market road actually gets you there. Keeping all this info in a handy-dandy notebook can save you a lot of time. Plus, notebooks make fun keepsakes! What’s next? Will you be writing any other books about historic cemeteries, or will this be the only one? While I knew that cemetery symbolism was a huge topic, it really hit home while writing Understanding Cemetery Symbols. In fact, there’s a lot of research that didn’t make it in, because every single chapter could easily be expanded into an entire book of its own. There’s a chapter on crosses, for instance. Sounds simple, right? But not only are there well over 300 different types of crosses, but nearly every cross goes by at least four different names, and an extensive history. I focused on the crosses you are most likely to see in historic graveyards for my book, but there are so many more. So there’s a possible book topic, right there. The same goes for my chapters entitled “Saints, Angels and Other Beings,” “Cemetery Architecture,” and “Plants, Flowers and Trees.” I had fun researching these topics, but there’s much more than I could fit into a single chapter. And don’t even get me started on the chapter about “Clubs, Secret Societies & Organizations.” Considering that at one time there were over 2000 active fraternal organizations in America, you can see how there’s another topic that could easily grow into a book of its own! That said, when I give presentations, audience members really love hearing about all the quirky graves I’ve seen, such as the military grave for Douglas the Confederate camel, or the alleged space alien grave in Aurora, Texas. That one could well be my next book! Why do you think exploring historic cemeteries is so worthwhile? 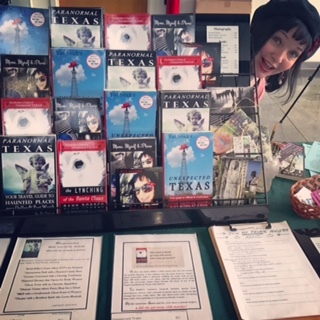 Check Out Those Awesome Books, Yo! Check out the book trailer! Music by Tui Snider! Tui lectures frequently at universities, libraries, conferences and bookstores. 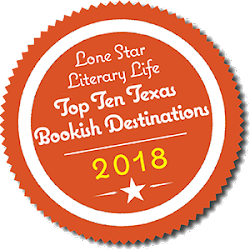 Her best-selling books include Paranormal Texas, The Lynching of the Santa Claus Bank Robber, Unexpected Texas, and Understanding Cemetery Symbols. She recently taught classes based on her books at Texas Christian University. 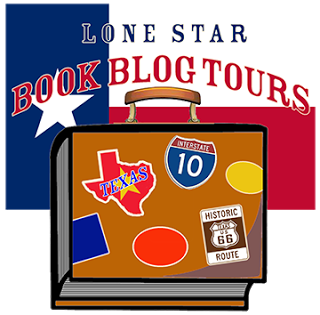 When not writing books, you can find Tui exploring the historic graveyards and backroads of Texas with her husband, Larry. You are so very welcome! It's a true pleasure to host you on my blog. You are welcome here anytime!